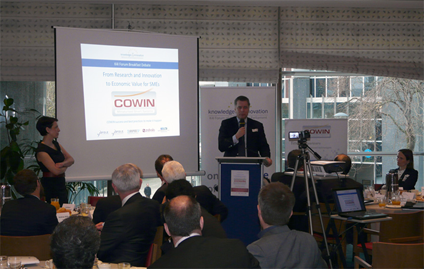 COWIN, a European Commission Coordination and Support action, aiming supporting commercial exploitation of EU collaborative research projects organised a Reception and a Breakfast debate, in cooperation with Knowledge4Innovation, in the European Parliament on 17-18 March 2014. The event, hosted by Ms Teresa Riera Madurell, MEP, Rapporteur for Horizon 2020, presented the successful activities of COWIN and culminated in an award ceremony to honour the most successful young entrepreneurs in the field of smart systems. During the last three years, this Coordination and Support Action dedicated to contribute to bridge the gap from research to market has generated more than 15 million euro direct early stage investment opportunities, while setting-up an attractive ecosystem for exploitation. COWIN engaged more than 1200 industrials and more than 60 VCs to consider investing in early stage ICT start-ups. The event gathered Members of the European Parliament (Christian Ehler, Kent Johansson, Amelia Andersdotter), Corporate representatives, Venture capital firms (Banexi Venture Partners, QBIC Venture Partners, Capricorn Venture Partners), EC officials (DG RTD, DG Connect), networks and technology platforms. Speakers included Mr Khalil Rouhana, Director, Components and Systems at DG Connect, Roberto Zafalon, R&D and Public Affairs, EU Technology Programmes Director ST Microelectronics andGéraldine Andrieux Gustin, Senior Partner Yole Finance. Following the speeches, three succesful entrepreneurs received the COWIN Entrepreneurship Award. Sylvain Ballandras has been awarded for his ability to evolve from researcher to entrepreneur. He has created Frec|n|sys in March 2013 and has demonstrated a real capacity to successfully set-up a team, generate contracts and strategic partnerships to support the growth of his company. Markus Riester and Ruth Houbertz have received the COWIN Entrepreneurship Award for Outstanding Contribution to innovation in ICT Hardware and Smart Systems especially for the far reaching disruptive nature of the technology platform they are exploiting in launching the company Multiphotons Optics GmbH. The process addresses one of the major bottlenecks in photonic packaging and allows creating a high volume manufacturing process chain for packaging of photonic components. The Award committee highlighted that Europe needs such technologies to reinforce its production capacities. Entrepreneurship can be also a synonymous of researcher, this is what Jesus Ruano, researcher at Ik4- Ikerlan demonstrated during the COWIN project with his strong commitment to reach commercial exploitation of the successful Labonfoil project. Labonfoil is a unique microfluidic platform integrating sample preparation and PCR analysis in a benchtop analyser. He received the COWIN Entrepreneurship Award by Jean-Luc Mate from Continental. Ms Madurell, MEP, stressed that „the importance of COWIN lays in providing research institutions and partners with support to reach maturity for further investment. It offers interesting companies the access to exploit collaborative research results to the market. I hope that COWIN continues to work under Horizon 2020, because we need more than ever initiatives, which will help to leave behind the valley of the death of our innovation chain“. Mr Roberto Zafalon, ST Microelectronics argued that „the business model, provided and pushed through by COWIN represents one major step concerning the transfer from pilot lines to the market, resulting in wellness, revenues and recovery“. Mr Ehler, MEP, Rapporteur for the Horizon 2020 Rules of participation, emphasised „the need to identify certain sectors where the leverage is high, like the smart systems field, and focus our funding instruments on them. The security issues, within the ICT area are becoming more and more important and it is one of the areas where we have realistic chances to get R&D production back to Europe”. According to Mr Jean Luc Mate, Continental Engineering Services, “COWIN is starting a unique process, something which has not existed before – to give a chance to young entrepreneurs from different fields to cross the death valley and succeed”. Khalil Rouhana, Director Components and Systems DG Connect at the European Commission, explained the approach to innovation in H2020 and the role of initiatives like COWIN. He highlighted the importance of smart systems in future development of ICT including the Internet of Things and the need to accelerate the transformation of Europe’s knowledge and research assets in this field into commercial successes. Mr Andreas Wild, ENIAC JU, asserted that “COWIN took European policies and implemented them in a clever way, by helping the SMEs, finding the relay of companies engaged in the growth path and providing support through the ecosystem“. According to Ms Geraldine Andrieux Gustin, Yole Finance, „the key for COWIN’s success is that we focus on one thematic – smart systems – and we cover the whole value chain from research to private investments in conducting operational actions. With a market pull approach, we have set up an attractive ecosystem for investment and for the growth of European champions“. For more information about the event, including photos and participants, please visit the event page here.